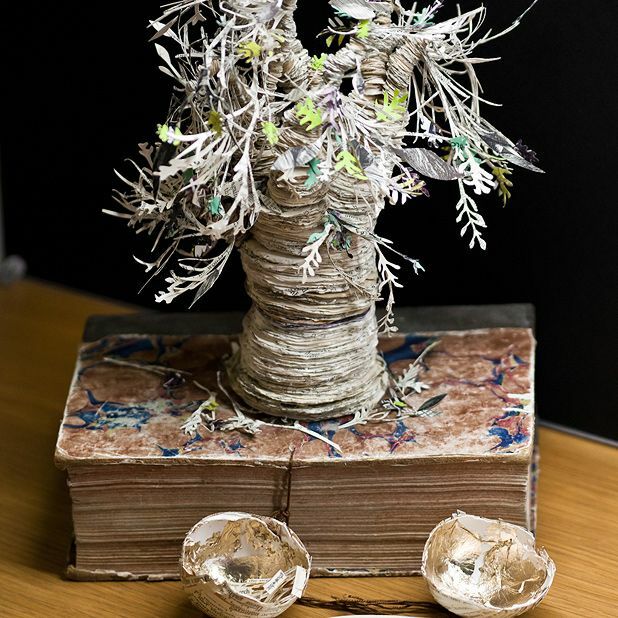 On a quiet day last March, the Scottish Poetry Library received an unexpected gift; a tree, fashioned from words and paper, blossoming from the yellowing book it rested upon. 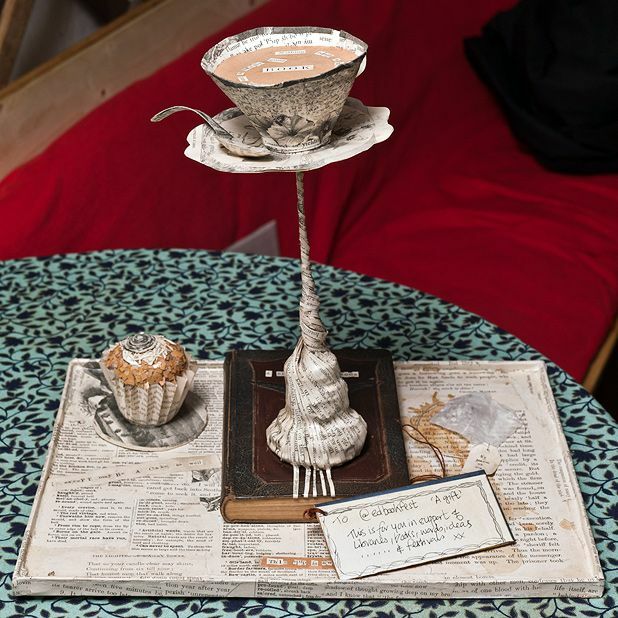 Throughout 2011, ten intricate sculptures appeared at creative organisations throughout Edinburgh, each with a tag addressed to their Twitter alias but with no name from the donor; it became a mystery with a modern twist. A year on, an exhibition of all ten sculptures is being prepared and the artist remains unidentified. In the midst of it all, the Edinburgh Evening News claimed to know their identity, but a poll suggested the majority of the public didn't want to know, and the sculptor was never revealed. 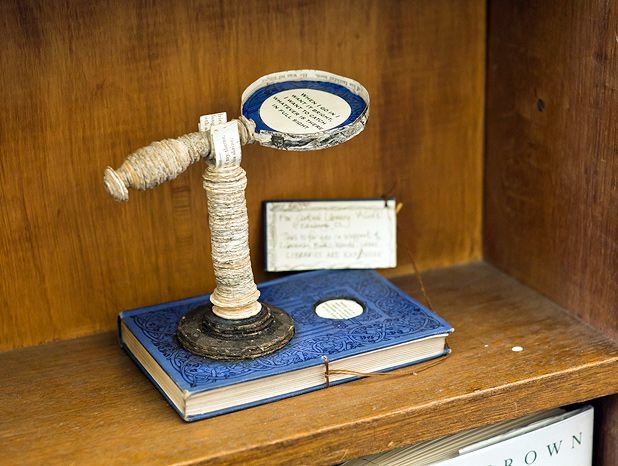 Hughes was there when the first sculpture, christened 'The Poetree', was discovered at the Scottish Poetry Library. Librarian Julie Johnston came across it on an upstairs table: 'I went downstairs and asked if anyone knew what it was, but no-one had seen anything.' At the base was a broken egg containing words from Edwin Morgan's poem 'A Trace of Wings'. Staff were delighted but baffled as the tag gave them no clues, only a message of support. They felt it only right to share their gift, and it soon had a vast following on Twitter. No artist came forward. The same month, a 'Paper Cinema' was left at Filmhouse's box office. Made from Victor Hugo's Les Miserables, it showed characters bursting from a screen and into an audience that included Ian Rankin drinking a Deuchars. 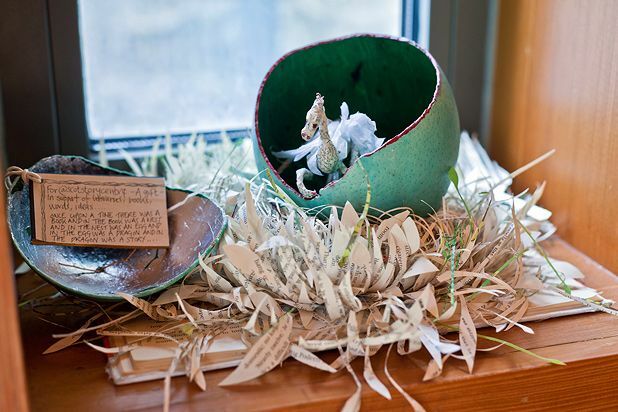 In July the artist struck again when the 'Story Dragon' hatched on a quiet windowsill at the Scottish Storytelling Centre. 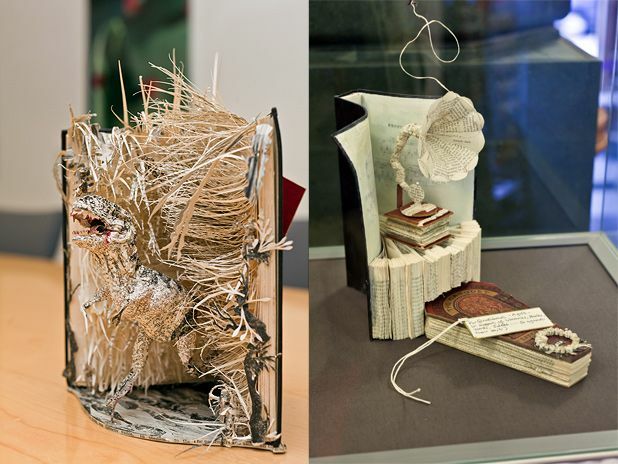 Rankin's book Knots and Crosses was used to create the dragon bursting out of an egg. 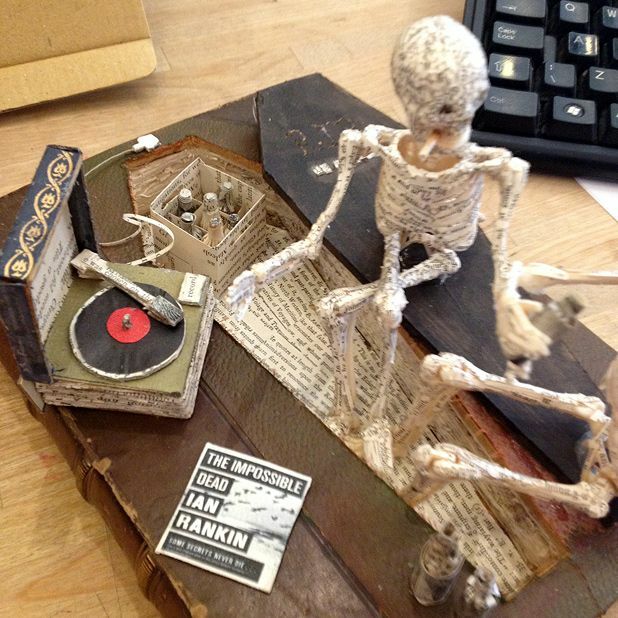 During Edinburgh's festival season two more were discovered at the Book Festival in August. UNESCO's was a wee man sitting beneath a tree, sculpted from James Hogg's Private Memoirs and Confessions of a Justified Sinner. 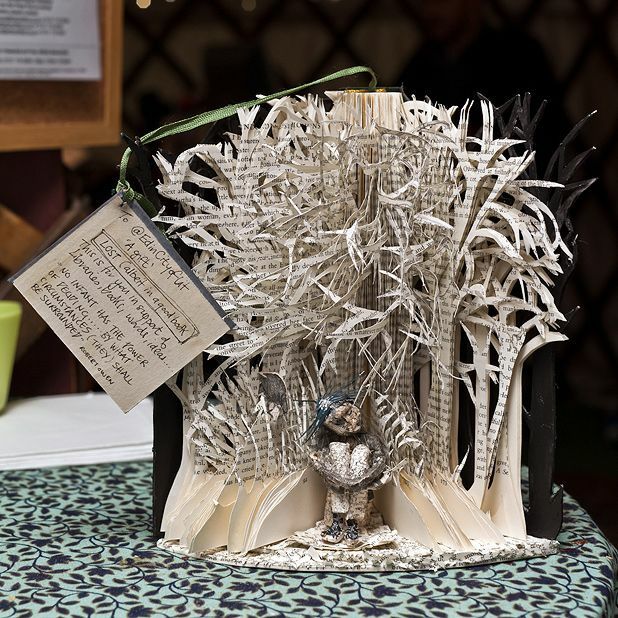 EIBF's was discovered in the festival Bookshop, featuring a leaky teabag, paper tea cup and cupcake. Not a Rankin reference in sight, but Twitter still went wild. At the end of August, Edinburgh's Central Library discovered the 'Magnifying Glass' on an empty bookshelf, zooming in on words plucked from Edwin Morgan's poem 'Seven Decades'. Libraries are 'expansive', not 'expensive' , the message suggested. The sculptor's theme was becoming even more obvious, and their increasing generosity implied that they too wanted to contribute to Edinburgh's cultural heritage. 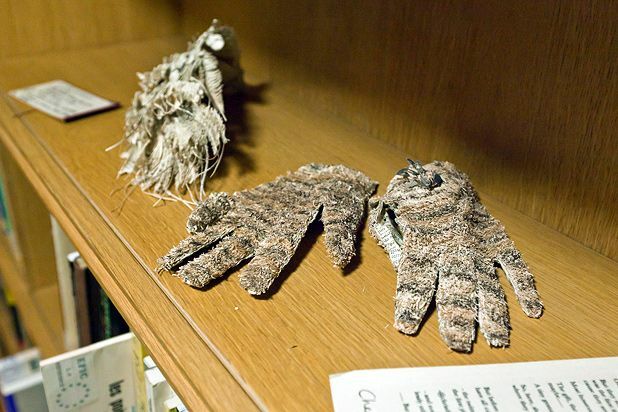 A paper 'Cap and Glove' made of paper bee fur and bird wing rested beside a farewell note. It offered thanks to 'the twitter community who in some strange way gave rise to the idea in the first place'. She implied that community was the heart of the project (another revelation in the note 'she' wrote) saying: 'we have all colluded to make this work'. 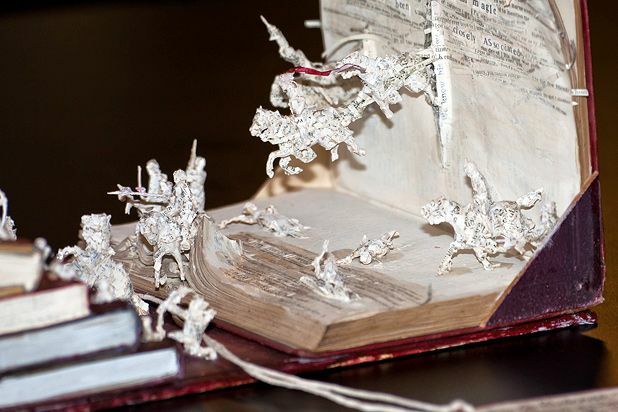 The 10/10 implied that the paper trail was over, but sculptures eight and nine were still to be found. The next day a 'T-Rex' was discovered beneath the skeleton of a stag in the recently refurbished National Museum of Scotland. Created from Arthur Conan-Doyle's The Lost World, it was labelled '(9/10)'. 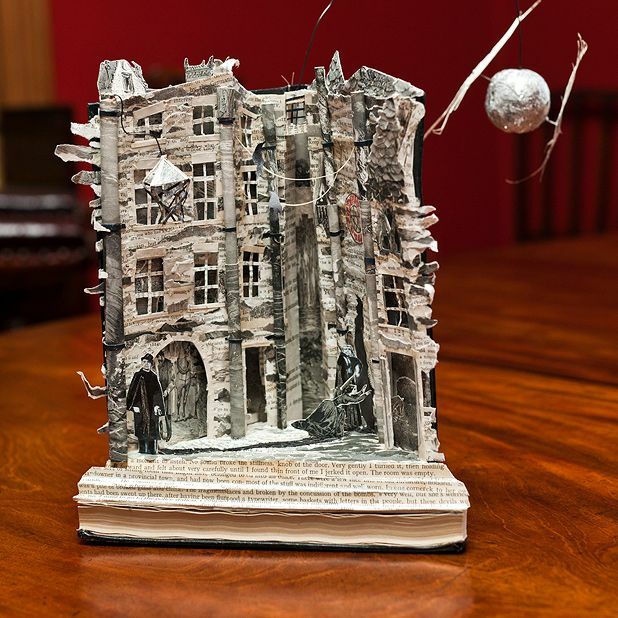 Later that day, the Writer's Museum discovered a night-time city scene from Robert Louis Stevenson's Jekyll and Hyde, complete with full moon hanging in the sky, on top of their donations box. 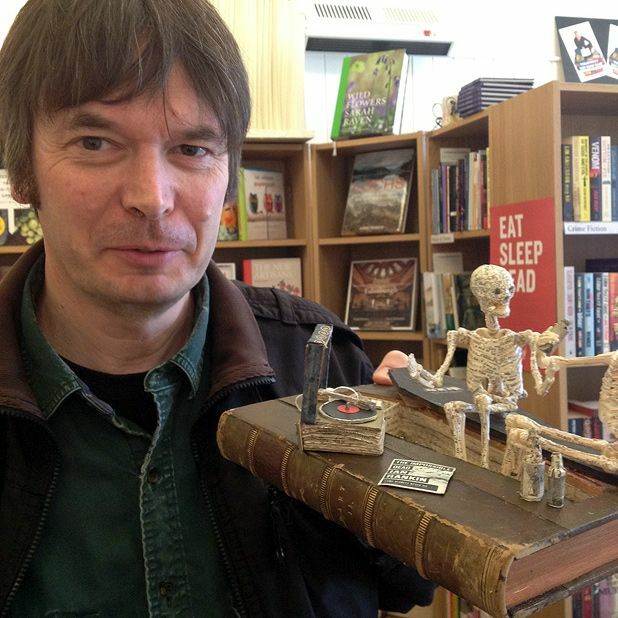 Ian Rankin's novel Hide and Seek was used, and the '(8/10)' confirmed this was the final sculpture. Whatever the reason behind them, these works have united a city in recognition of it's cultural organisations. Whoever the artist is, she's shown that sometimes all it takes is a good, old-fashioned mystery to get Edinburgh's artistic juices flowing.